For the Chinese badminton player also surnamed Lin, see Lin Dan. Dan Lin was born in Taipei, Taiwan, the son of an executive in the international food industry. He moved to the United States at the age of five. In 1994, Lin received his undergraduate degree from the Wharton School of the University of Pennsylvania, and in 1999, he earned an M.B.A. from Harvard Business School. Between his first and second year at Harvard Business School, Lin undertook a summer internship program with Lorenzo Di Bonaventura, who was then an executive with Warner Bros. Pictures. In 1999, a day after Lin's graduation, the studio executive offered Lin a junior position at Warners. Lin worked his way up to Senior Vice President of Production and left in 2007 to form his own company. During his eight years at Warners, Lin oversaw the development and production of the Academy Award-winning film The Departed, directed by Martin Scorsese. Other films Lin oversaw include 10,000 BC, directed by Roland Emmerich; The Aviator, directed by Martin Scorsese; Alexander, directed by Oliver Stone; TMNT; The Invasion; Unaccompanied Minors; Matchstick Men; Scooby-Doo 2: Monsters Unleashed; and Torque. 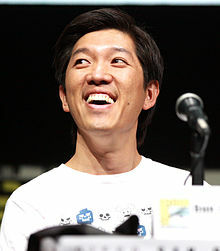 In January 2008 he formed Lin Pictures, based at Warner Bros. He described the transition from development executive to producer as natural: "It’s a symbiotic relationship between the studio and the producers, we all work together towards the same goal – make the best movie possible." ^ Andreeva, Nellie (September 22, 2017). "Lin Pictures Hires Former Tristar TV Exec". Deadline. Retrieved September 26, 2017. ^ a b "Film and Television Production Company". Lin Pictures. Retrieved December 12, 2011. ^ "Exclusive Interview: Producer Dan Lin on SHERLOCK HOLMES; Plus he Addresses the Brad Pitt Rumors". Collider.com. Retrieved December 12, 2011. ^ Fleming, Michael (September 3, 2008). "Dan Lin – Entertainment News, 10 Producers to Watch, Media". Variety. Retrieved December 12, 2011. ^ "The 30 Most Powerful Film Producers in Hollywood". The Hollywood Reporter. April 13, 2015. Archived from the original on October 2, 2017. Retrieved October 1, 2017. Wikimedia Commons has media related to Dan Lin.